Holwell Sports edged Rushden and Higham to bag back-to-back wins and their first points on the road since the opening day of the season. Neil Miller’s side were once again caught cold as their afternoon got off to another bad start. From Rushden’s first attack, Dyson flicked on to Gosnal-Tyler who expertly beat his marker to deliver a testing cross which O’Dell gratefully dispatched. But Sports responded positively, with Luke Peberdy and Mike Hendey getting control of midfield, well supported by Harris and Matt Hendey on the flanks. Holwell were playing some good football as the movement of Ambrose and Stevenson up front caused plenty of problems for Rushden. Matt Hendey went close from Harris’ low cross, while Kieran Lane’s shot from outside the box beat keeper Swailes, but struck the base of a post, and Ross Dunlop’s header then just cleared the bar. Holwell’s pressure finally told when Peberdy rose high to power home a superb header from Matt Hendey’s cross. Lane then got back to make an excellent tackle and thwart a dangerous Rushden moment when Thomas looked to have broken clear. The second half continued in the same vein with the relatively new partnership of Peberdy and Mike Hendey in Holwell’s central midfield pulling the strings, while skipper Bitmead and Dunlop dealt well with Rushden’s more direct approach. 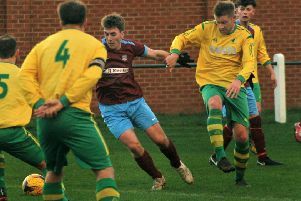 Holwell took a deserved lead when Lane slipped a through ball to Ambrose who confidently rounded Swailes and slotted home a deserved reward for the Holwell frontman. The visitors went close to increasing the lead when Mike Hendey whipped in a cross, but Stevenson flashed a header wide. Despite looking comfortable, Holwell began to make errors as some sloppy clearances encouraged Rushden to push more men forward. And the visitors were knocked back when their combative full-back Lane was sent off with 20 minutes left for a second yellow card. With Bitmead commanding the defence, Rushden were finding it difficult to carve out any clear-cut chances, while keeper Challis dealt confidently with a string of crosses. Ambrose tried a clever backheel which was smothered by Swailes as Holwell’s 10 men searched for a third goal to kill off the game. The visitors were working tirelessly to protect their lead, with Hazeldine’s last-ditch tackle breaking up another Rushden attack. In the dying minutes, Holwell’s defence was finally breached as O’Dell burst clean through, but with only Challis to beat he elected to pass, allowing Josh Clark to clear the danger. The loose ball fell to Looker, but his weak shot was blocked for the second time on the line by Clark and Holwell hung on for a big three points. “It was a very satisfying team performance,” said Holwell general manager Steve Hendey. “We played some good controlled football and then showed our battling qualities when down to 10 men. The result moved Holwell up to 15th and lifted them seven points clear of the bottom three and within two points of 13th-placed St Andrew’s. On Saturday they host title hopefuls Anstey Nomads at Welby Road (ko 3pm). Holwell: Challis, Clark, Bitmead (c), Lane, Peberdy, Mike Hendey, Matt Hendey, Harris, Stevenson, Ambrose, Hazeldine, Gaskin, Dunlop.